I finally took a belly pic of BC #2! I took my first belly pic with Silas at 18 1/2 weeks and again at 19 1/2 weeks and the difference was pretty significant. I've found the same thing with this pregnancy. 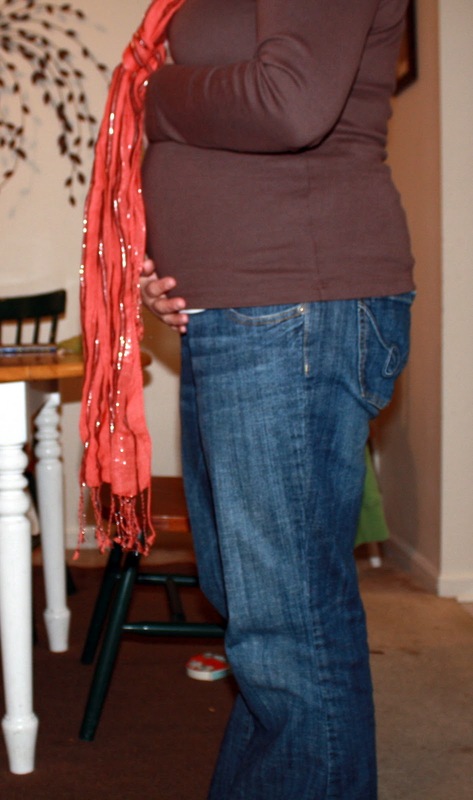 My belly seems to really blossom at about 19 weeks. 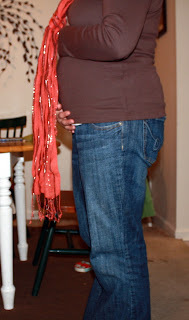 Below is a picture of my belly at 19 1/2 weeks for Silas. As far as the pregnancy, I've been feeling pretty good. 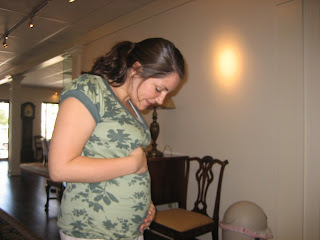 I'm still suffering with indigestion, but I'm expecting that to stick around until the baby makes his/her exit. And, of course, with the growing belly comes more tossing and turning at night trying to get comfortable. Good sleep is kind of hit or miss these days. I'm definitely feeling the baby move more, but Kevin hasn't been able to feel anything yet. It's so hard to get the timing right! This weeks highlight had to be when Kevin really tried to explain to Silas that Mama has a baby in her stomach. Silas proceeded to wave to my belly and say "hi baby." He then proceeded to kiss my belly. It was such a wonderful moment. We find out the baby's gender on Dec. 17th (next Friday). I'm hoping that once we're able to give the baby a name Silas will be able to connect even more. FYI, according to my gender poll, 34% of you think it's a boy and 65% of you think it's a girl! I'm so ready to find out! Click here to see what I was up to at 19 weeks during my pregnancy with Silas.